Note: Your tone is critically important with the above statements. You must come across calm, neutral, and non-threatening. “I’m sorry you feel you need to talk to someone else, but that’s the reason I’m here. I have been given full authority to help resolve your concerns. May I have the opportunity to address this first? “Before we hang up I want to be sure to tell you…” This statement psychologically leads the customer toward the end of the conversation. “I don’t want to take up any more of your time so let me give you…” You can make this statement even when the customer has called you. “I wish that were possible, but your request is beyond my level of authority. I will, however, check with my manager. Reiterate what you know, what you can do, and what they can expect. Be honest with the customer. Do not let the customer make you give an immediate response. Do not make any promises you can’t keep. 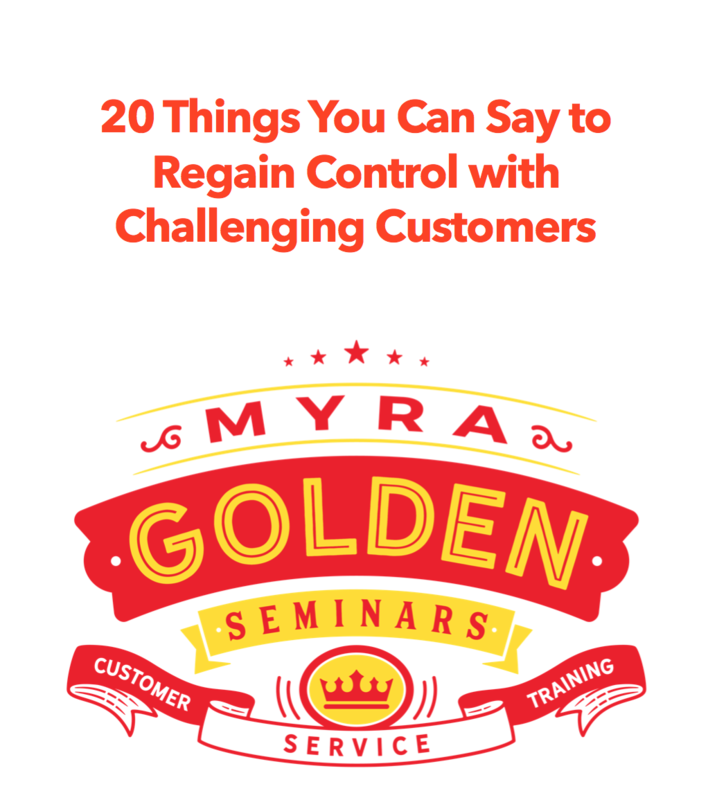 Download a PDF of Myra’s Phrases so you can share this with your employees. Thanks Myra .. This is so useful..
I’m sending it to a few pals ans also sharing in delicious. And naturally, thanks to your effort! opportunity, Guess I’ll juist book mark this page. So excellent to discover a person with some original views on this subject matter. on the web, somebody with somewhat originality. Great job for bringing a little something completely new online! your sharing this one. A must read article. Great site, continue the gokd work!